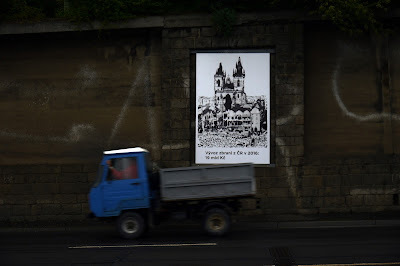 The wall of Letenské sady features images of famous Prague towers: Old Town Tower, Žižkov Television Tower, Powder Tower, Šítkov Water Tower and Towers of the Týn Church. Dominant features of Prague, which is also referred to as "The City Of a Hundred Spires", are easily recognized by locals as well as visitors. However, the black and white images leave a disturbing impression. Instead of appealing tourist motifs, these are scenes from a war-destroyed city. 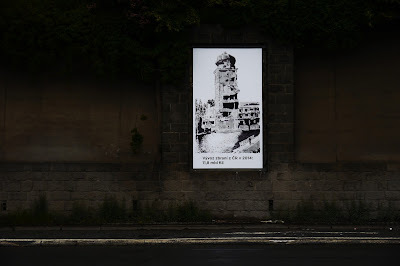 Oto Hudec's exhibition entitled "Prague Day After the Bombing" highlights the mass export of arms from the Czech Republic into unstable and undemocratic regimes. The exhibition was organized in cooperation with Amnesty International Czech Republic, which has been drawing attention to the problem of uncontrolled arms exports. The author purposefully confuses the cause and effect. The capital of the Czech Republic is exposed to the devastating effects of arms exported. 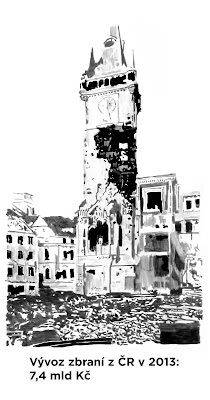 City sights turn into terrible ruins thus presenting the real impact of weapons, which is hidden behind seemingly innocent export statistics. The exhibition raises the issue of co-responsibility for war conflicts. Oto Hudec commented on his concept: "As long as we export the weapons used in wartime conflicts, this issue will concern us all. In this case, there is no argument that global conflicts and their consequences are the responsibility of the world powers alone. With regard to arms exports, the declarations that problems should be solved in the countries where they originated remain empty words." The individual pictures are supplemented by data on arms exports from the Czech Republic, which is increasing every year. From official data that the Czech Republic publishes it is not possible to determine what types of arms were exported and to which countries, which makes it more difficult to control them. Many times, however, it has been proved that supporters of undemocratic regimes also use Czech weapons. "Amnesty International has long drawn the Ministry of Foreign Affairs of the Czech Republic to serious contradictions between the declared support of democracy and human rights on the one hand, and the export of military material to countries where the violations of human rights happen, on the other. We want to make exports of arms from the Czech Republic transparent and, most importantly, not to support human rights abuses anywhere in the world,” says Martina Pařízková from Amnesty International ČR.